“Lucy The Cat” is a 5-Star book for kids and cat lovers. It’s a charming story about Lucy, the curious, cute Sacred Birman cat. Especially cat lovers of all ages will enjoy this book and it is excellent reading for children from 2 to 8 years. After reading this book you will certainly love Lucy The Cat. When Lucy was a small kitten she had to move away from her cat mama. Now she lives happily with her human foster mom and dad. She is always very busy because she wants to help her mom and dad in all kind of daily chores. She loves especially watering flowers, because water is a big mystery. Sewing machine is also very interesting and what would be more fun than climbing up the Christmas tree. Lucy is a modern cat and wants to know what’s going on in the world. Laptop and iPad are excellent tools for that. And of course she is the boss and she has the final say. Lucy loves everyone and wants to be your friend. Let Lucy tell her own story with beautiful pictures and her own words. Meow to everyone! Know what you are writing about. His charming illustrated fairy tale book “Kissa Kiiskinen sankarina ja muita satuja” was published in March. So far it is available only in Finnish, but hopefully some day translated also in English. This book is filled with fascinating stories about cats, dogs, horses, princes, princesses, witches, trolls and other traditional characters, published in March 2014. 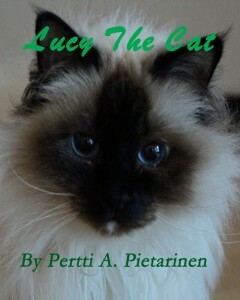 Lucy The Cat is now available also in Finnish and it is called “Lucy-Kissa, Lucy The Cat”.